Hi folks! I've relocated to southern California and am actively taking time off from teaching yoga. Check back soon (or scroll down and add yourself to my email list) to see when I'll be back in New Jersey teaching, and when I'll be starting up a California schedule. Thanks! These classes are designed for those who are new, or somewhat new to yoga. Class is typically slow paced, and explores the basics and foundations of the practice -- including asana (poses), breath work, and body-mind connection. The goal is to bring students to a centered and calm place, while building strength and flexibility. Currently, I offer these classes in a gym and on a college campus. Email for more details. Yoga classes and/or private sessions that are modified and customized for specific populations. I have offered yoga to cancer patients, cardiac patients, people in recovery, homeless teens, youth with cancer, and individuals on the Autism spectrum. I have received advanced training to work with the populations through Kula for Karma. Email for more details. This class typically begins with a Sun Salutation warm-up series, emphasizing the importance of connecting breath with movement. Class will incorporate more challenging postures such as creative standing balance, arm balancing and inversions. There will be modifications and variations offered for all poses so that the intensity and challenge is up to the individual. Be prepared to have fun, sweat, tone and break through internally perceived physical and mental limitations. The room averages 95 degrees Fahrenheit. Slow Flow is the perfect blend of slow movement and stillness. Loretta will guide you through this 75-90 minute experience that includes a slower vinyasa sequence followed by yin yoga and restorative poses. A slow flow allows you to feel the poses and transitions while calming your central nervous system. Yin yoga poses stress the connective tissue in our bodies, like fascia and ligaments, which is optimum for flexibility. Restorative poses are restful and lead you into even deeper relaxation. You will use props to help the mind and body feel totally supported and relaxed. This class is open to all levels. This mix of ROMWOD techniques and Yin Yoga is the perfect balance for any CrossFit athlete. The Level 1 class typically moves slow, with an emphasis on increasing mobility in the shoulders, thoracic spine, wrists and ankles, while learning how the fundamentals of a yoga practice can create safe habits in CrossFit. Level 2 classes are quicker paced, and include more of a vinyasa like style. These classes focus on mobility, as well as more advanced posture to assist athletes with inversions and more strength and core-based balance. Individualized yoga sessions to meet the specific needs of the participant(s) (i.e. recovering from an injury/illness), and are tailored for participants (day, time, level, duration, etc). This setting offers an opportunity for students to develop a deep relationship with the self. Sessions can be offered in home, or at a location convenient for the participant(s). A FREE consultation will be offered to gather details on the participant's lifestyle and needs. Private sessions can be 1-on-1, or up to 3 participants. Email for more details. 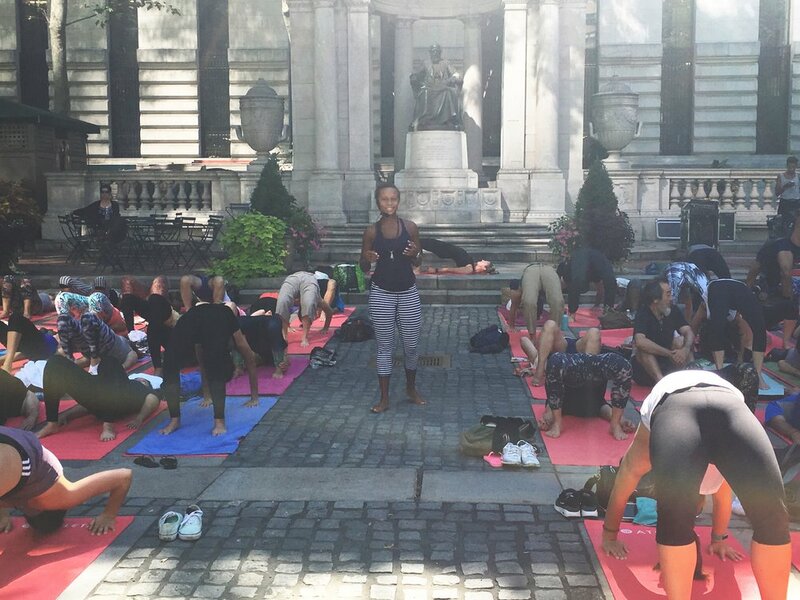 Yoga classes that are offered exclusively to corporate employees for stress relief, increasing office productivity, and tools for better focus. Classes are offered on site and are tailored for participants (day, time, level, duration, etc). This setting offers the conveniency of being able to practice without having to leave the office/workspace. Yoga mats and props can be provided. Email for more details.